We have been spending the New Year with my family in central Newfoundland – enjoying lots of fun, food and some very wintery weather. The ground is already under several feet of “the white stuff” following a very snowy December and yesterday’s storm. The forests are laden in snow, looking like intricately decorated Christmas trees adorning the countryside. And the record-breaking cold snap that has been going on all week has seen temperatures plunge to well below “frigid”, with windchills well below -30C. Sticking close to home in this cold, snowy weather has given me a chance to reflect on the past year – one that was wonderful in so many ways, including birding. Townsend’s Warbler – while very rare in eastern North America, this was an incredible 14th record for Newfoundland! The cold, snowy weather of the first few weeks of THIS winter is a stark contrast to the much milder weather this time last year. 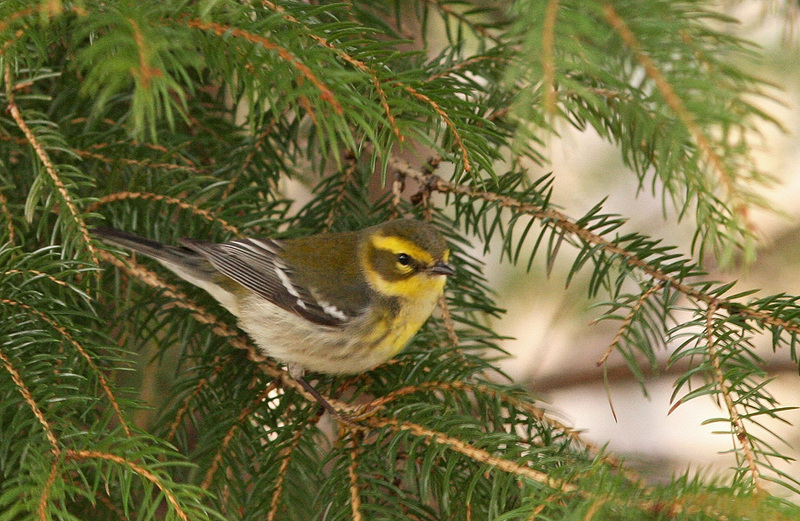 At least five species of warbler were still kicking around in St. John’s when January 2013 rolled in, compared to just three species seen in December 2013! In fact, one of my birding highlights of last year was spending some quality time with a rare TOWNSEND’S WARBLER (first found on the St. John’s CBC) on New Year’s Day. Pink-footed Goose. This popular bird marked an impressive eighth record for Newfoundland. One of the highlights as winter continued was the PINK-FOOTED GOOSE that took up residence in a local St. John’s park after being originally discovered in nearby farm fields back in November. It became popular with the many walkers who visit the area daily and was likely one of the most-photographed birds ever in the province. It was the eighth record for Newfoundland, but first in winter. 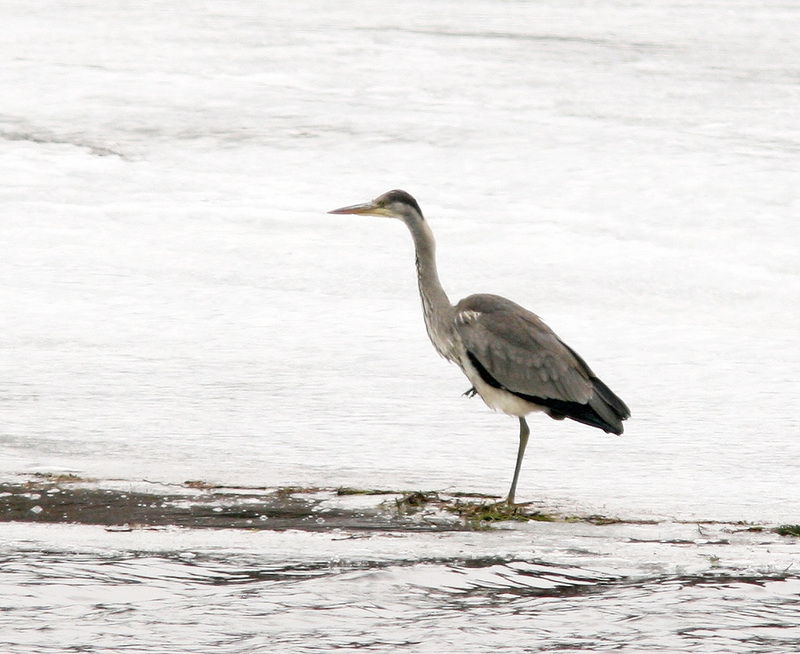 The immature Gray Heron arrived at Little Heart’s Ease in early March, marking the second record for the province. March, which is often one of the more “boring” months for birders in this province, was punctuated by very exciting news – a mega-rare GRAY HERON was hanging out in an open estuary at Little Heart’s Ease!! It was the second for Newfoundland and only the third or fourth for all of North America! Amazingly, it stuck around for many weeks, and was enjoyed by many birders from all over the continent who trekked out to see it. I also had another personal highlight at the very end of March when I was able to enjoy and photograph an IVORY GULL in my hometown of Lewisporte while visiting my parents for Easter. Such a great bird! 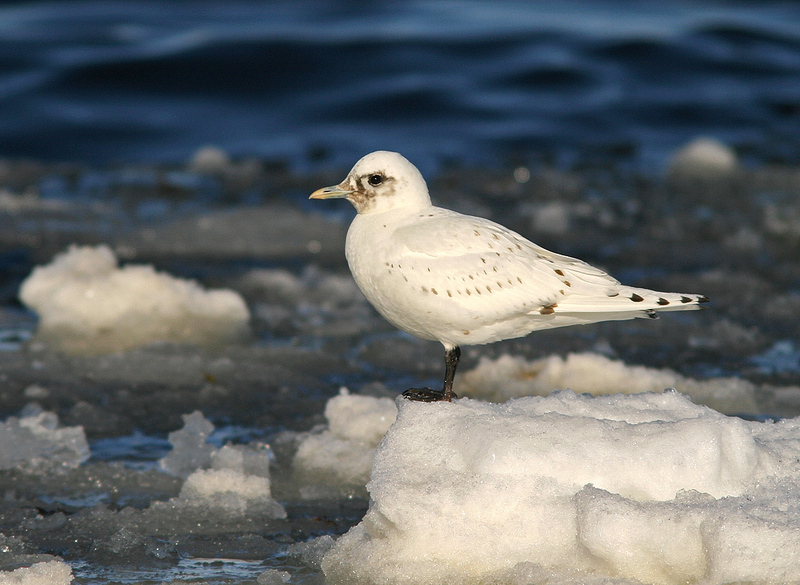 The iconic Ivory Gull – one of my favourite birds! A “Greenland” Greater White-fronted Goose that dropped in at Biscay Bay. 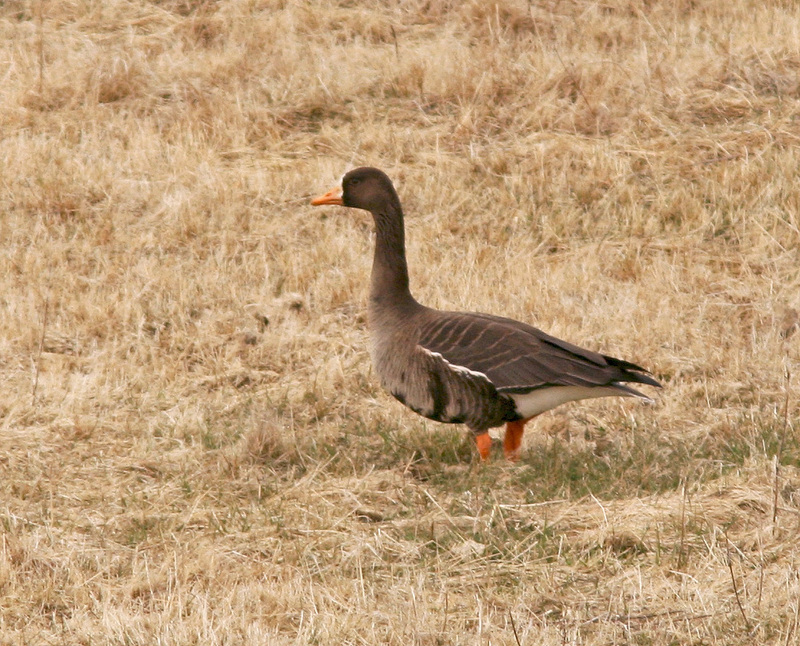 Around the same time, strong northeasterly winds brought two “Greenland” GREATER WHITE-FRONTED GEESE to Twillingate on the northeast coast. While I didn’t get a chance to go see these, I did manage to catch up with another that arrived in Biscay Bay a few days later (early April). Spring continued to heat up, with two LITTLE EGRETS being discovered at Fair Haven, at the northern end of Placentia Bay. While this was the ninth record for this primarily European species, it was the first opportunity I had to see one on this side of the Atlantic. 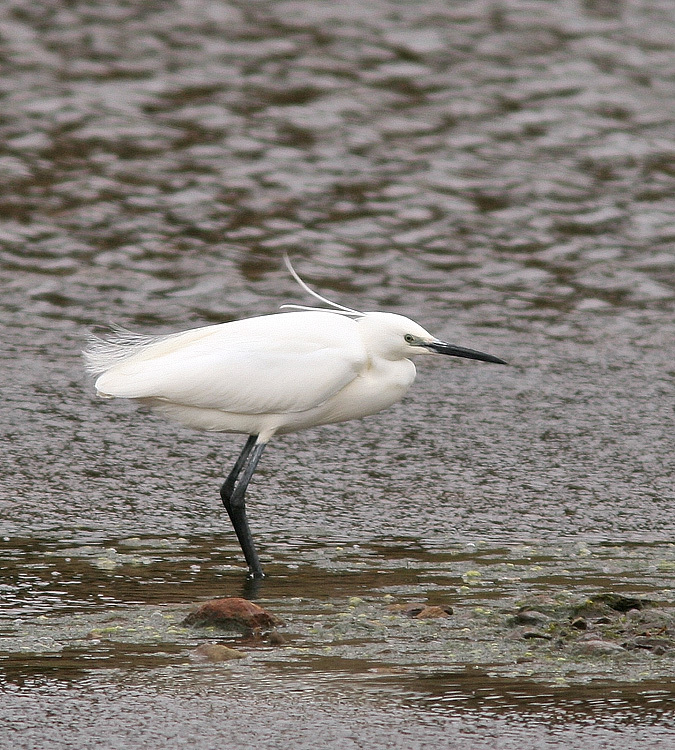 This Little Egret, one of two that spent some time in Fair Haven this spring, was a great addition to my Newfoundland list. 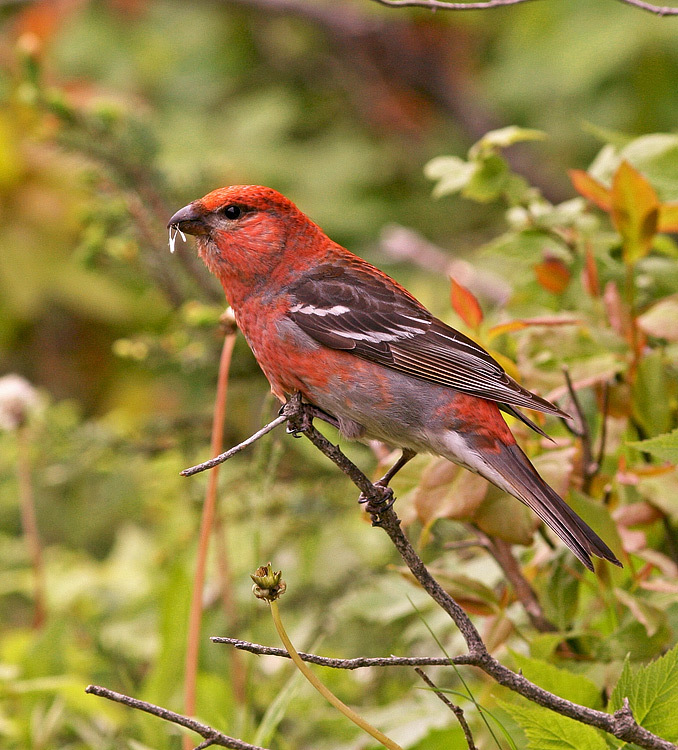 Pine Grosbeaks were especially obliging at several locations during our tour, including this stunning male at Gros Morne National Park. I was very fortunate in June to lead two bird & nature tours in Newfoundland – sharing the incredible beauty and wonder of my province with visitors from across Canada, Europe and the United States. The first excursion, for Eagle Eye Tours, enjoyed great birds in the form of Boreal Owl, Black-backed Woodpecker, and Grey-cheeked Thrush, along with the amazing spectacles of Witless Bay and Cape St. Mary’s Ecological Reserves (read more here). The second trip, for Massachusetts Audubon, continued all the way across Newfoundland to beautiful Gros Morne National Park, enjoying great birds, whales, and wildflowers along the way (read more here). 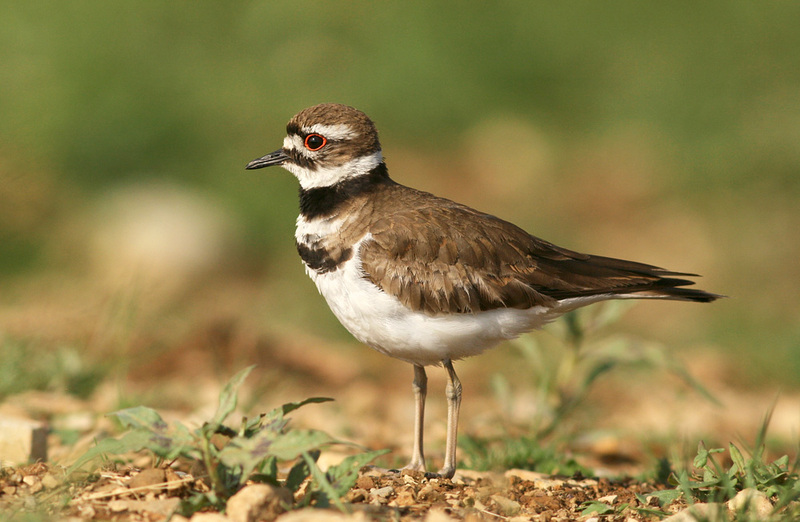 Late summer included a fun photography session with a family of Killdeer at a private horse stables in Logy Bay – they have bred there the past few years, and I was kindly invited to spend a morning with them once the young had fledged and were running around the fields. One of the biggest highlights of my entire year was the Eagle Eye tour that I co-led in New Brunswick — visiting great places like Kouchibouguac National Park and Grand Manan Island. Our group soaked in an amazing shorebird spectacle at Johnson Mills, the stunning forests of Acadia, and wonderful seabirds & whales in the Bay of Fundy. 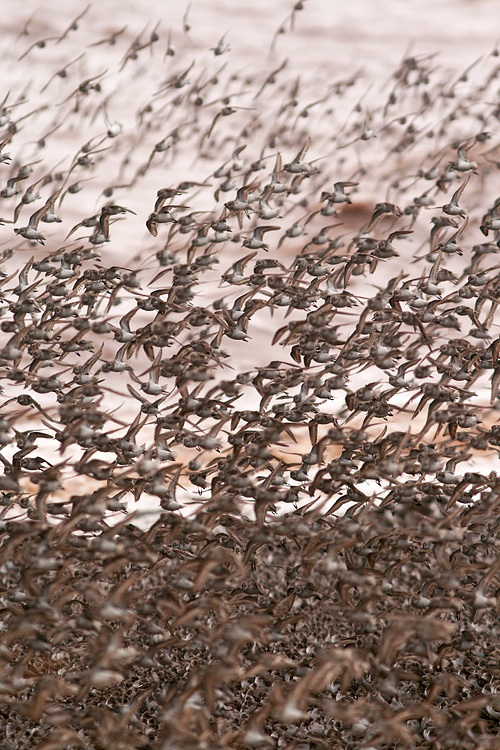 Tens of thousands of Semipalmated Sandpipers were roosting at Johnson Mills at high tide. An estimated three-quarters of the world’s population of this small shorebird stop over at the Bay of Fundy during southward migration every year. This stunning Yellow-throated Vireo was the big highlight of this year’s BMI birding. It is quite rare in Newfoundland, with maybe a dozen or so records. Fall is always an exciting time for birding in Newfoundland, when we spend our time searching for wayward migrants and wanderers that we rarely see. One of my earliest rewards this season was a YELLOW-THROATED VIREO I discovered during our annual “big day” event in late September. This bright little stunner is found less than annually in Newfoundland and was only my second ever, despite lots of time spent looking. Check out this post to see what other gems were found during the day! 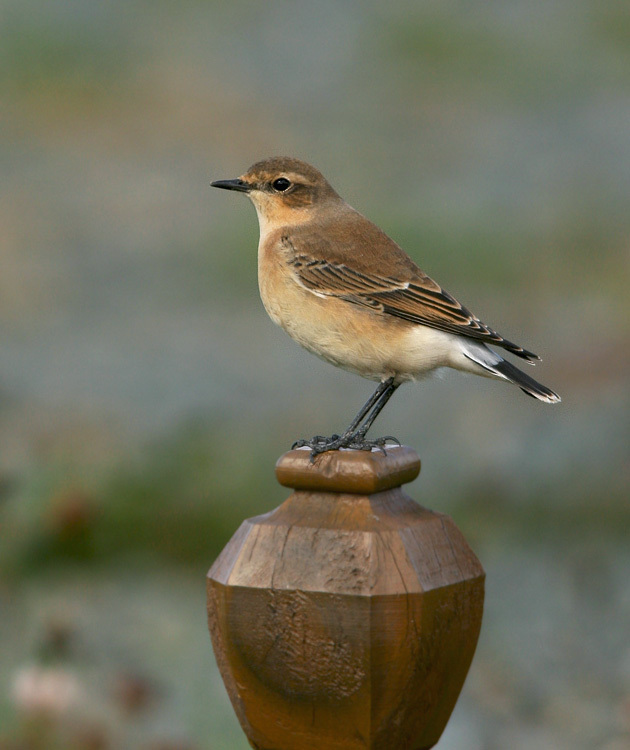 This Northern Wheatear was part of mini-invasion into Newfoundland this fall. As usual, October turned out to be one of the most happenin’ months of the year. Highlights included at least 10 NORTHERN WHEATEARS that dropped in around the Avalon and northeast coast, a PINK-FOOTED GOOSE photographed in Bonavista, and a long-staying YELLOW-CROWNED NIGHT HERON in a Torbay neighbourhood. 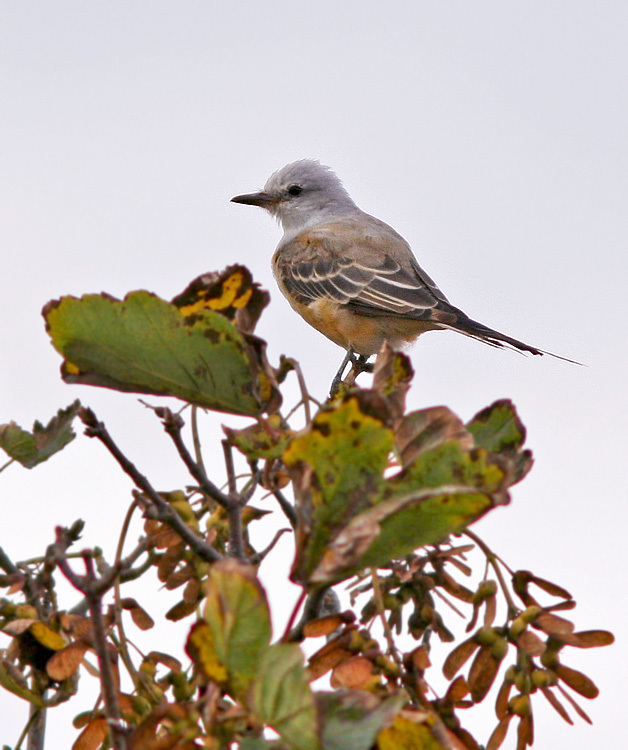 However, the clear-cut star of the month was a SCISSOR-TAILED FLYCATCHER also discovered in Torbay, where it hung out for about ten days and was seen by many birders! Not surprisingly, it was just the second record for Newfoundland. This moulting adult Scissor-tailed Flycatcher marked the second record for the province, but the first that was able to be enjoyed by birders. And enjoyed, it was! This Virginia’s Warbler, originally discovered on November 14, 2013 marked the first (and very exciting) record for the island if Newfoundland. It remained elusive during the first few days, frustrating a number of birders – myself included! 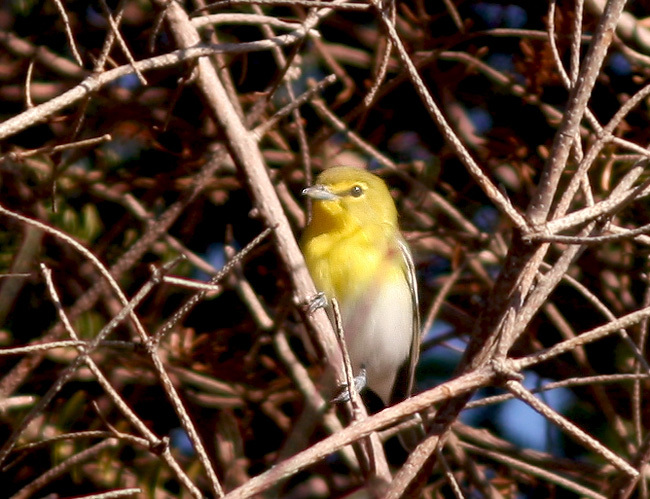 Possibly the most exciting bird of 2013 was discovered in mid-November – the island’s first VIRGINIA’S WARBLER. Despite hanging out in a relatively small area, this very unexpected visitor from across the continent was very elusive and it took me three stressful days to finally catch up with it! 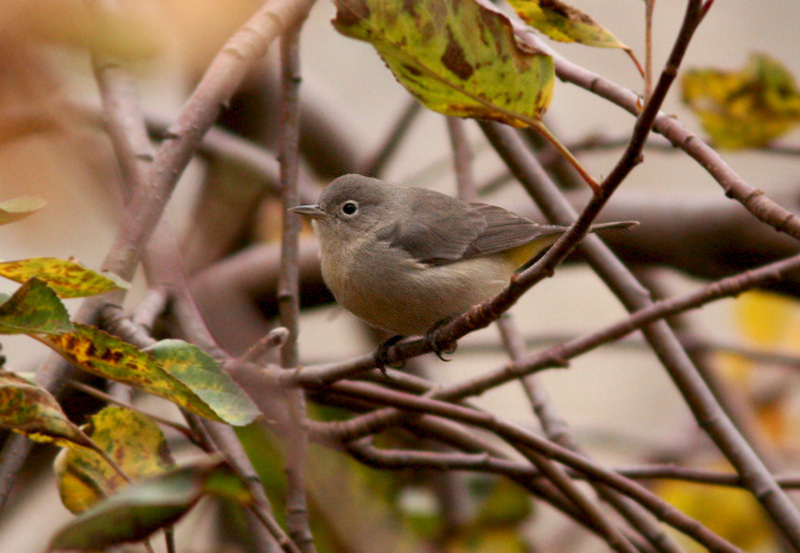 It braved some very cool temperatures until at least December 2, furnishing an excellent record for the winter list. I also caught up with another elusive bird – the YELLOW-LEGGED GULL that has been sneaking around St. John’s since late October. I was happy to see this Newfoundland specialty after nearly two years absence! 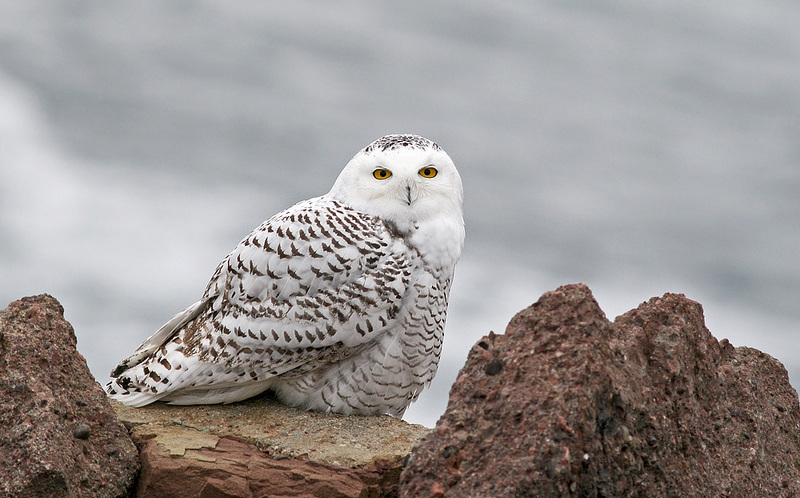 November also brought with it the first signs of what would turn out to be a massive invasion of SNOWY OWLS. These majestic, almost mythical birds from the north descended on much of eastern North America in late November and early December – but nowhere like the southeast Avalon, where as many as 300 were counted in a single day! I was fortunate enough to enjoy an intimate photo session with one of the beautiful owls at Cape Spear in early December. 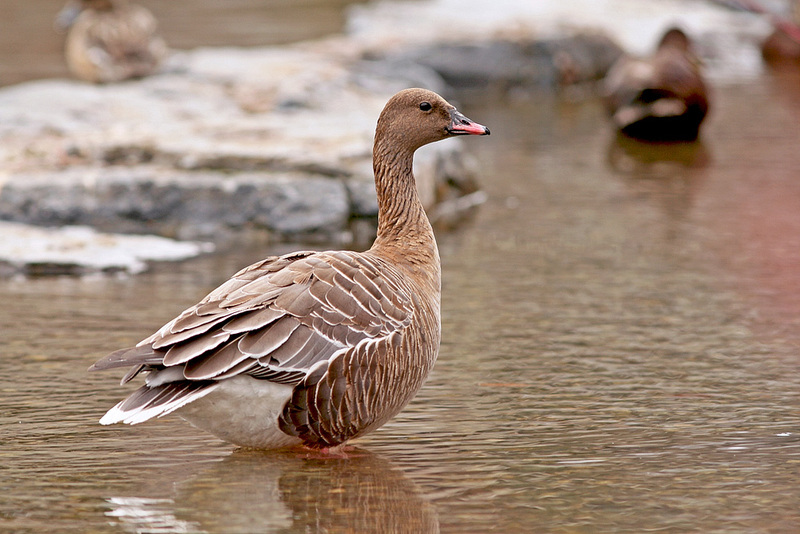 And the PINK-FOOTED GOOSE makes … 250!! Not only is this a major North American rarity (ABA Code 4), but it was only the second fall and now first winter record for Newfoundland. More importantly, according to my records, it is now the 250th species to have been recorded in Newfoundland during the “official” winter period (December thru February)!! This is a very impressive number considering our climate, location and the fact that the total number of species recorded here in any season is just 400. To keep tabs on the Pink-footed Goose, check the “rarity round-up” page for updates … I’ll try to keep it as current as possible.